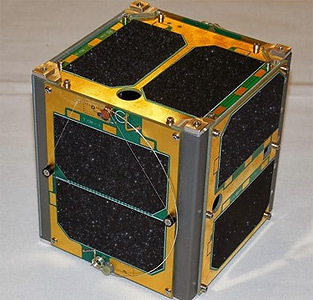 Fox-1C is a radio amateur and technology research cubesat developed by AMSAT and hosting several university developed payloads. Fox-1C is an 1U CubeSat designed to operate in Low Earth Orbit built on the flight spare of Fox 1A. It carries a 2 meter whip antenna and a 70 cm whip antenna. Fox-1C will carry a radiation effects experiment developed by the Institute for Space and Defense Electronics (ISDE) at Vanderbilt University, a Virginia Tech camera experiment, and a Pennsylvania State-Erie MEMS gyro experiment. Fox-1C will also serve as a communications relay for amateurs worldwide via the onboard FM repeater system. The communications and experiment missions will run concurrently. The repeater features a VHF downlink with FM analog voice and FSK data and UHF and L-band uplink. AMSAT has teamed with Spaceflight Inc. for integration and launch utilizing Spaceflight’s SHERPA system on a Falcon-9 v1.2 (Block 5) launch vehicle to a sun-synchronous orbit in the third quarter of 2015. The mission was the rebooked on the SSO-A cluster launch also on a Falcon-9 v1.2 (Block 5) in late 2017 or early 2018.